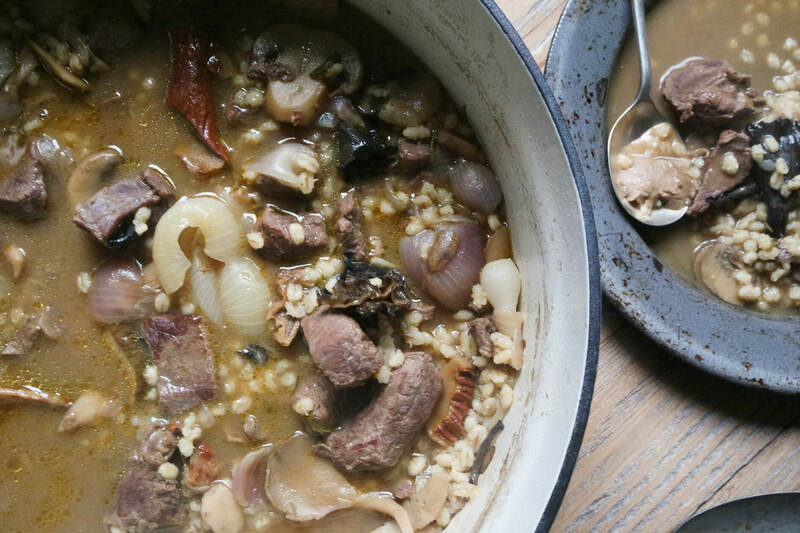 A true hunter and gatherer dish, this venison stew with barley and a variety of mushrooms is a hearty meal in a bowl. Folks tend to have very specific ways of liking their deers processed. Some are into cutting small deer steaks, others prefer to keep the backstraps whole, and others still want as much jerky as they can possibly extract. Me? Well, I prefer to harvest at least a couple bags of diced or cubed venison. Sure, it’s traditionally a tougher meat but when cooked slow and braised, it becomes wonderfully tender. The advantage of dice is that there is also more bite and texture than with ground meat, which makes it perfect for chilis, stews and even soups. 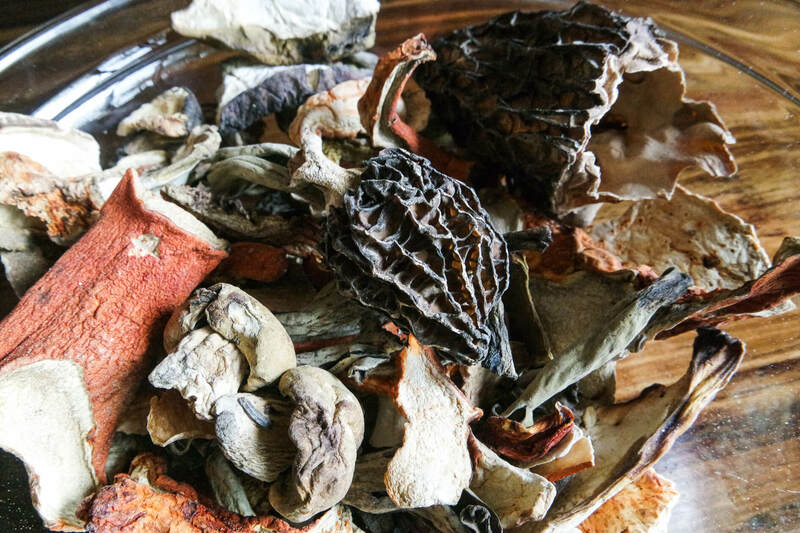 I used a bunch of different mushrooms in this recipe – a medley of fresh varieties and a mix of dried including porcini, morel and lobster. Admittedly, it’s a fairly expensive mix which I only had access to thanks to a very fancy local store, but you can easily (and frugally) use dried shiitakes. 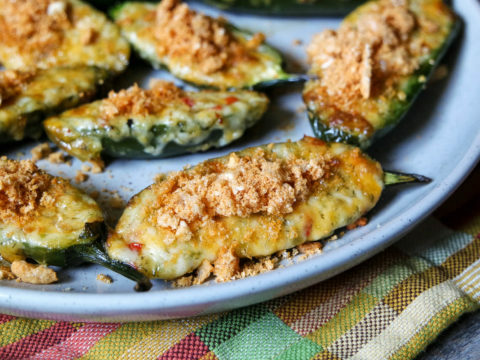 These are super easy to find and still have a wonderful flavor. If you are in a position to gather your own mushrooms then kudos to you. Truly that makes this an even more self-sufficient recipe. But please, if you don’t have experience with wild mushroom foraging, don’t set off into the forest and pick things at random. That could end up being quite disastrous. In a fatal way. Actually, let’s just stick with storebought, ok? Not the world’s biggest deer fan? Take solace, non venison folk! This recipe would work equally as well by substituting in beef or lamb. To make your own venison stock, check out this recipe. Place the dried mushrooms in a bowl and pour over enough boiling water to cover, making sure they are submerged. Let mushrooms soften and rehydrate, at least 10 minutes. In a large heavy based pot (I use an enameled cast iron dutch oven) over high heat, add half the olive oil and brown the venison pieces, working in batches to avoid overcrowding. Season meat with salt as you go. Remove meat to a seperate bowl once browned. Add remaining oil to the pot, then brown the onions and fresh mushrooms, about 5 minutes. Return meat to pan, then add the dried mushrooms AND the water they were soaked in, plus the stock and water. Bring to a boil. Add barley, then reduce mixture to a low simmer. Throw the herbs on top, stems and all, and put a lid on the pot. Cook until venison is tender, stirring occasionally, 60-80 minutes. Season with salt towards the end of cooking to avoid concentrating the salt flavor. Remove the herbs before serving.